Mid-winter Christmas is (I think) a uniquely New Zealand/Australian tradition. As it is the middle of summer for us at Christmas time, more and more people are choosing to keep it simple by having a BBQ, salads, seafood and strawberries, rather than the heaviness and hassle of a full traditional Christmas dinner in 25 degree heat. To ensure we don’t miss out on all that yummy food(!) some of us hold a mid-winter Christmas dinner during June or July, where we eat more of the traditional Christmas foods such as turkey/ham/chicken, roast vegetables and inevitably, Christmas pud. In the past I have made steamed Christmas fruit pudding for our family get together, but I couldn’t be bothered making it, wrapping it all up and then steaming it for 3 hours. 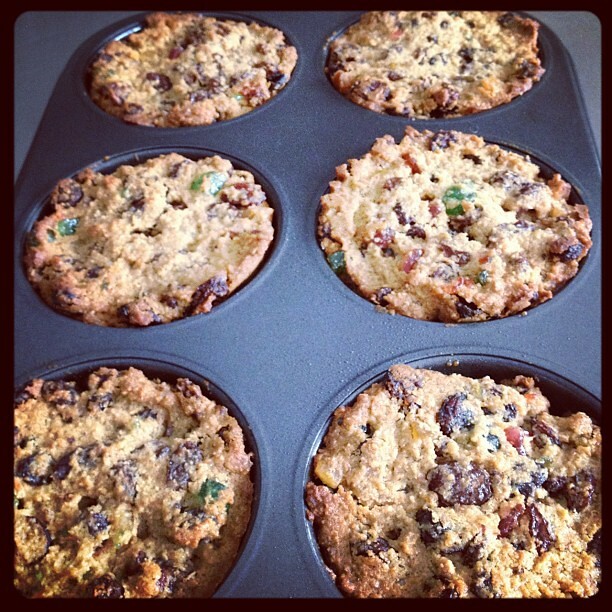 So I found this great recipe from Taste.com.au that I adapted, for individual Christmas puddings made in muffin tins. 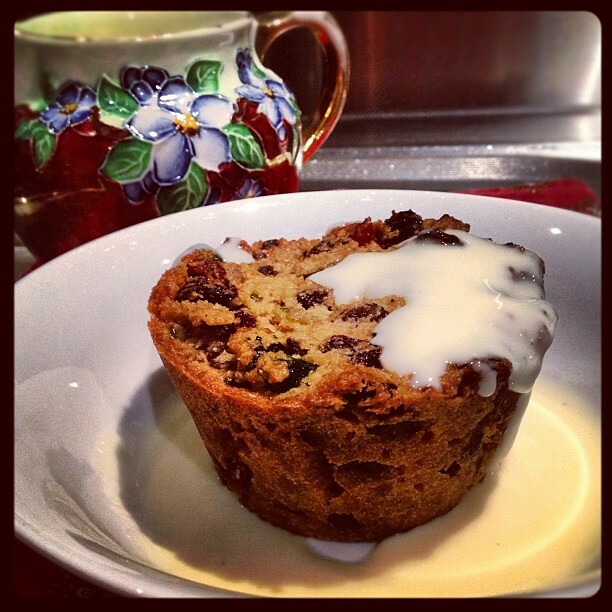 They were so easy to make and my guests thought they were even better than traditional steamed pudding (or maybe they were just being polite?!) Little Miss Two loved hers and was asking for more. So goodbye complicated steam pudding recipe, from now on I’m making these! 1. Preheat the oven to 150 degrees celcius. Grease 8 Texan muffin tins. 2.Place the mixed fruit in a bowl and pour the orange juice over. Allow to soak for at least half an hour. 3. Beat together butter and brown sugar until pale and creamy. 4. Add eggs one at a time and beat well between each addition. 5. 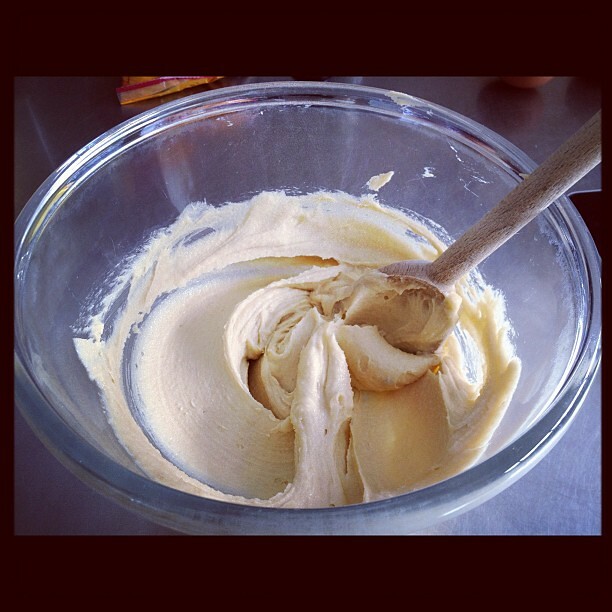 Sift flour and mixed spice over butter mixture. 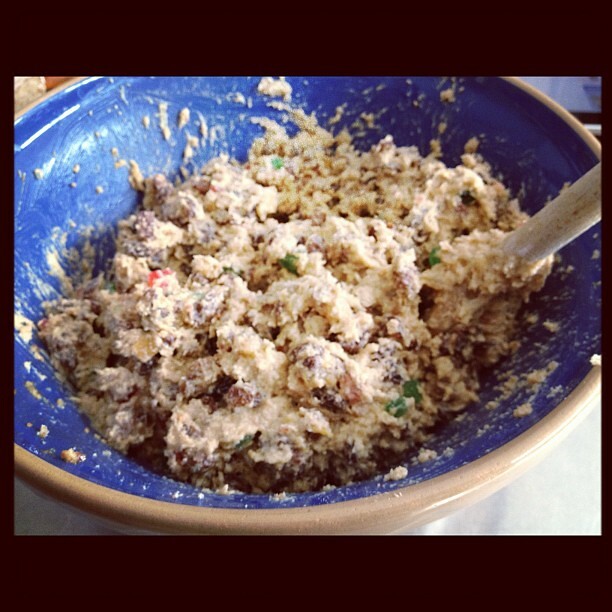 Add breadcrumbs and fruit/orange juice mixture, almond essence and lemon juice and combine well. 6. Divide mixture amongst muffin tin. Cover loosely with baking paper (to help prevent burning), and bake for 35-40 minutes until skewer comes out clean. Cool for 10 minutes in the tin, then turn out onto a wire rack. Serve with custard and cream. You can substitute some of the orange juice with brandy for more of a kick (I didn’t because the kids were eating it), so 1/3 orange juice, 1/3 brandy. The original recipe suggests warming in a saucepan for 2 minutes before pouring over the fruit. Omit the almond essence and lemon juice if you add brandy.